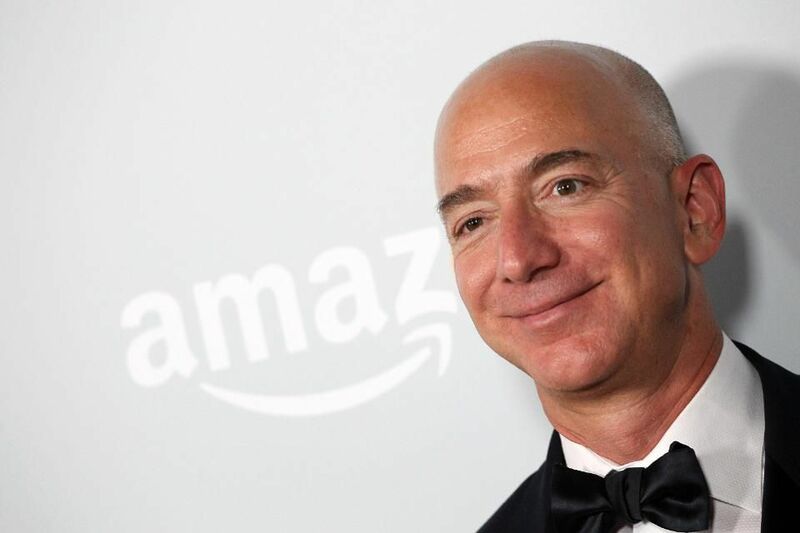 Amazon founder and CEO, Jeff Bezos officially became the world's wealthiest person in March 2018, going by Forbes' 2018 Billionaire List. Bezos also set the bar high as the world's first centi-billionare. A centi-billionare is a person worth a hundred billion dollars minimum. The latest figures by Forbes' Real-Time rankings of world's billionaires give Bezos a net worth of $126.2 billion. In July 2017, the eCommerce mogul overtook Bill Gates to become the richest man alive. Jeff Bezos founded Amazon in 1994 after leaving his formal employment at a Wall Street firm. Initially, he chose the name Cadabra for his new venture but later changed it. Bezos started his online company purely as a bookstore. His plan was to make it the greatest bookseller in the world. While searching through a dictionary, he gravitated towards the name Amazon. This name was both unique and exotic and amazon.com went online for the first time in 1995. All this while, this pioneering starter was working from his home garage in Bellevue, Washington. Within the first two months, the online bookstore was showing real signs of initial success. It had sold books in virtually all states and to over 40 countries. In fact, the eCommerce site was selling up to $20,000 weekly. The company first sold its stock in 1997 with an initial public offer under the NASDAQ stock exchange. In 1997, Amazon was sued by Barnes & Noble for claiming to be the largest bookstore in the world. An out-of-court settlement was reached with this suit but Amazon did not drop the claim. At the turn of the 21st century, tech companies and online players suffered a bubble burst; commonly called the dot-com bubble burst. The company had to lay off over 1,400 employees. In addition, it had to diversify its business model. Used books and other products were introduced to the marketplace. By 1999, the world had started recognizing Amazon and its role in the online shopping space. To this end, Time magazine named Bezos Person of the Year in 1999, to honor his efforts. Today, Amazon has a global workforce of over 306,000 both in full and part-time basis. The highest ever recorded Amazon profit came in February, 2018. The company registered quarterly earnings of $2 billion. Bezos is keen to expand Amazon across India and the region owing to the great dominance by Alibaba in China. This effort has seen Amazon dedicate $5.5 billion for the purpose of localizing the supply chain routes. Today, Amazon is the greatest online retailer in the world going by market capitalization and revenue. In terms of total sales, the company comes second to the Alibaba Group. Over the years, Amazon has greatly diversified selling all manner of products. They also produce products like consumer electronics including Fire TV, Fire tablets, Kindle e-readers and Echo. They are also a world leader in the provision of cloud infrastructure. In 2017, the company acquired Whole Foods for just over $13 billion. This was geared towards increasing its presence in the offline retail market. Born Jeffrey Preston Bezos in 1964, Bezos would develop keen interest in technology. In 1986, he graduated with degrees in electrical engineering and computer science from Princeton University. As a man of many interests, he ventured into the aerospace world by founding the company Blue Origin in 2000. With test flights to space from 2015, the company envisioned starting commercial suborbital human spaceflight by 2018. Bezos also bought The Washington Post in 2013 for a quarter billion dollars. He is also a venture capitalist with his fund Bezos Expeditions. Bezos is married with four children. In 2003, the eCommerce titan was involved in a helicopter accident in West Texas. After the chopper tail hit a tree, Bezos suffered minor injuries; he was one of three passengers. His style of leadership has been influenced by among others Bob Iger, Jamie Dimon and Warren Buffet. Bezos will always be remembered for setting the pace where global eCommerce is concerned. When he started, many did not have faith or see the potential that was online shopping. In fact, an article published in August of 1994 in The New York Times suggested that companies that had invested online were likely to lose money. The article alluded to the Internet being a hyped topic at the time.